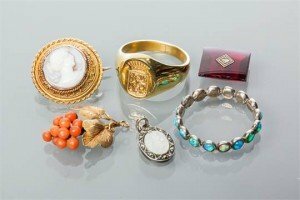 A group of various jewellery comprising an opal eternity ring in silver, a coral pendant formed as grapes, a cameo brooch, a silver mother of pearl pendant, a red gem with a diamond to the centre, and a signet ring with continental marks. 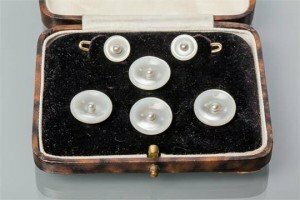 A 14 carat gold button and cufflink set comprising four buttons and a pair of cufflinks, all marked 585 for fourteen carat gold, in fitted case. 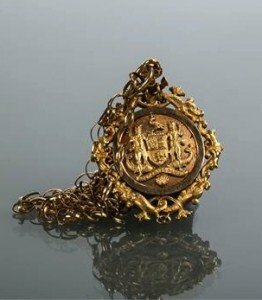 An ornate 15 carat gold medal of chain, the central circular section depicting the Glasgow city coat of arms flanked by two figures of Trident, the pierced moulded textured border with fish and scrolling motifs, hallmarked fifteen carat yellow gold, on a nine carat gold chain. 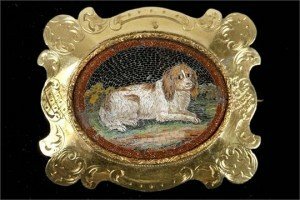 A 19th Century micro mosaic canine portrait brooch, the finely worked King Charles Spaniel framed by gold stone and set into an 18 carat gold cartouche mount with engraved decoration. 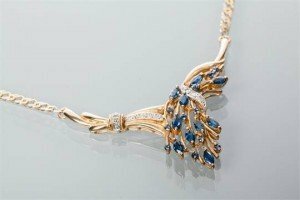 A sapphire and diamond necklet designed as a floral cluster of marquise and round diamonds, in nine carat gold. 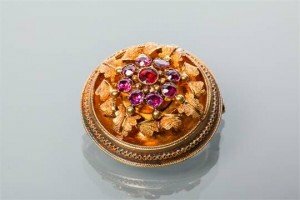 A Victorian garnet brooch of circular form, the central round garnet surrounded by eight round garnets, in an intricate foliate setting, unmarked. 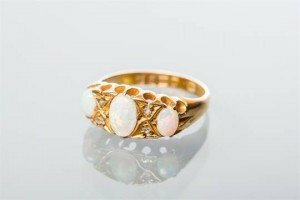 A Victorian opal and diamond ring set with three oval opals interspersed by diamonds, in a marquise shaped setting with pierced sides, in eighteen carat yellow gold. 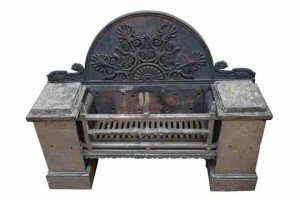 A large Regency polished steel and cast iron fire grate, the arched back with applied Anthemion and scroll decoration above a central fire basket between rectangular steel pedestals. 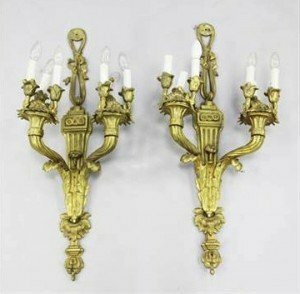 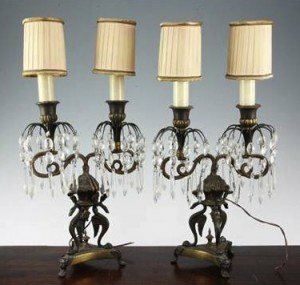 A pair of Louis XVI style gilt brass twin branch wall lights, each with a ribbon tied crest and cornucopia branches issuing three lights. 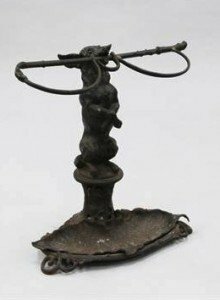 A Victorian Coalbrookdale cast iron umbrella stand, modelled as a begging dog with whip in his mount, the drip pan with diamond registration mark and pattern. 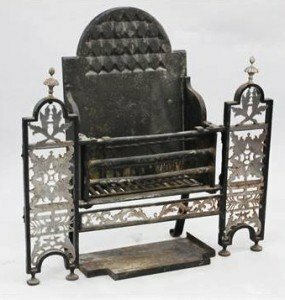 A 19th century cast iron and cut steel fire grate, the fire basket with arched back flanked between floral pierced cut steel panels, mounted with fluted finials. 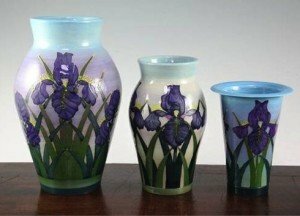 Sally Tuffin for Dennis Chinaworks. 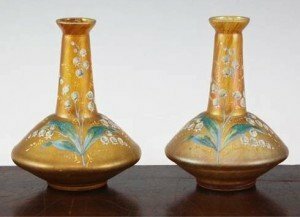 Three Iris pattern vases, two of graduated ovoid form, the other tapering cylindrical, impressed and inscribed marks. 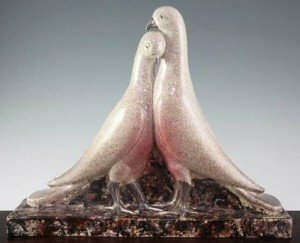 A French Art Deco pottery group of two doves, modelled by Genevieve Granger, decorated in mottled pink, brown and black glazes. 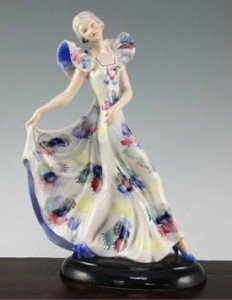 A W. Goebel Art Deco figure of a lady, 1930’s, the dancing figure holding one pleat of her polychrome splashed dress, on a black enamelled oval base, impressed marks. 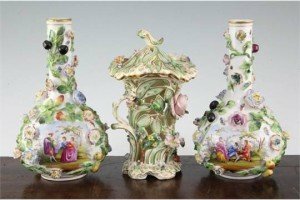 A pair of Potschappel bottle vases and a Derby pot pourri vase and cover, 19th century, the pair of Potschappel vases typically painted in Meissen style with figures in landscapes and encrusted with flowers, fruit and trailing leaves, cross hatched mark and T, 20.5cm, the Bloor Derby vase pierced and encrusted with flowers and leaves, iron red printed marks. 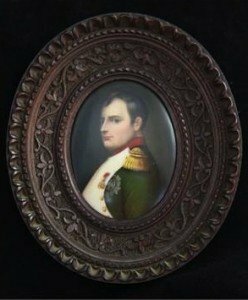 A Paris porcelain oval portrait plaque, late 19th century, painted with the figure of Napoleon Bonaparte, half length in uniform. 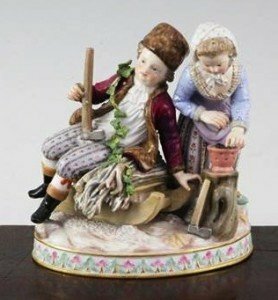 A Meissen group emblematic of winter, late 19th century, modelled as a boy seated upon a sled with a girl warming her hands by a brazier, underglaze blue crossed swords marks. 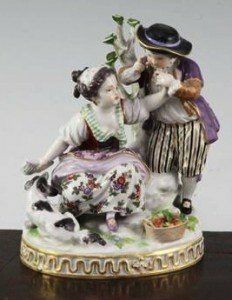 A Meissen gallant group, late 19th / early 20th century, modelled as a girl holding a letter with a boy standing beside her and a tree stump, with a dog and a basket of fruit in front of them, on a naturalistic oval base with gilt border, underglaze blue crossed swords mark.